Learn how to fill out Form 12.902f1, Marital Settlement Agreement for Dissolution of Marriage with Dependent or Minor Children (05/2014), with our do-it-yourself step by step instructions and helpful explanations. 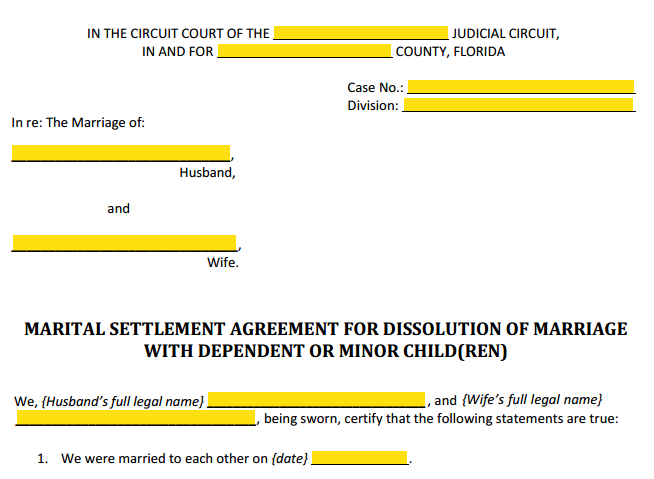 Florida's MSA with Children is usually filed with the Petition for Dissolution of Marriage with Dependent or Minor Children Form 12.901(b)(1). See our step by step instructions page for more information. Most people will be able to fill out their MSA and the supporting forms by using just this page as their guide. Ready to begin? Download the form below or open it in a new tab or window. Just right-click your mouse and then click "save as" to download. Notice: This page is for informational purposes only. This is not legal advice. If you need legal advice you should speak to an attorney. When you and your spouse have agreed on some or all of your issues, you should file this form. 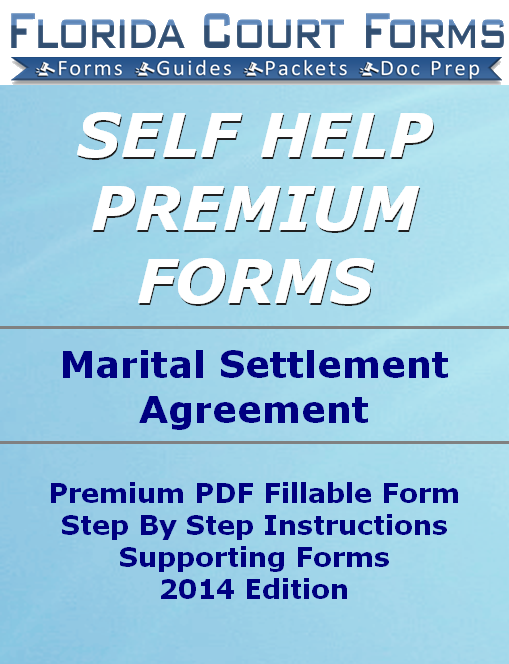 You may use this Marital Settlement Agreement form (MSA) for agreement on even one issue. Many pro se filers do not realize this. The more you can agree upon at the outset of your divorce, the easier the process and expense. 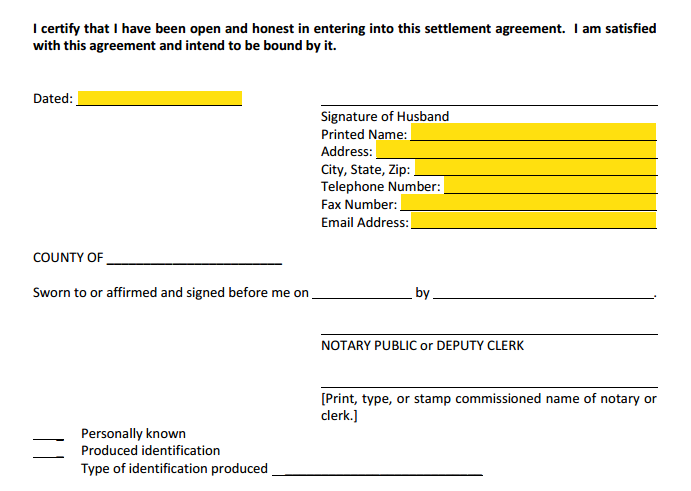 This form is used when a Petition for Dissolution of Marriage With Children (form 12.901b1 or form 12.950c) is filed. 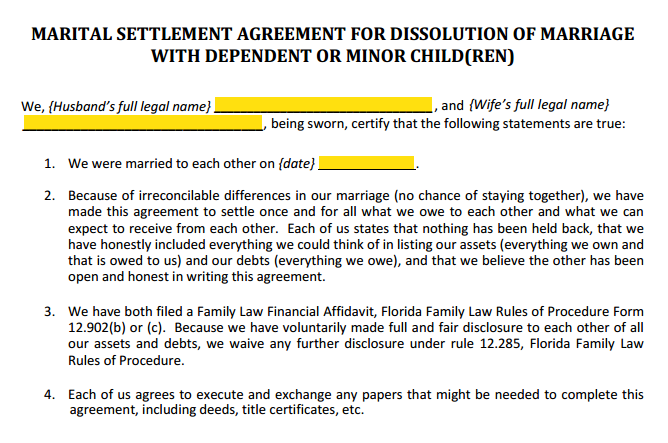 If you are filing for Divorce without children, you should use the other Marital Settlement Agreement form: MSA No Children. This form was never updated by the courts to be computer fillable. So write legibly in ALL CAPS with black ink. You can purchase our enhaced PDF fillable form 12.902f1 if you like the convenience of filling out this form on your computer. See the box just below . Your heading should be entered exactly the same way as you did the petition for divorce. The case number and division should be left blank for the clerk to assign if you are filing this form with the petiton. Otherwise, use the assigned case number and division that was given when the petition was filed. Our Premium PDF Forms have improved formatting and are fillable on your computer. Buy our Premium Forms Packet which includes the MSA Premium Form, these step by step instructions, supporting forms, and & much more. 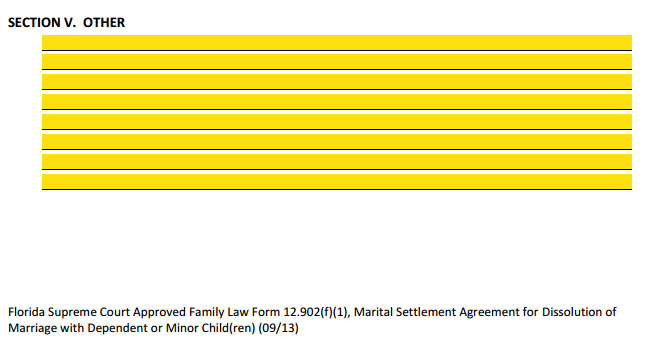 Supreme Court Approved form 12.902(f)(1) Marital Settlement Agreement With Children. Improved formatting with properly sized blank fields and PDF fillable. Most of the paragraphs (symbolized here with ¶) are self explanatory. However, some parts of these forms can be confusing. Where appropriate, we try to make them clear. ¶ 1. Enter the date of your marriage. This should be on your marriage certificate. ¶ 2. Statement attesting that your marriage is irretrievably broken, you have both been honest and complete about your debts and assets, and that you are making this final agreement. ¶ 3. You have filed your Financial Affidavits and you waive any further financial disclosures. 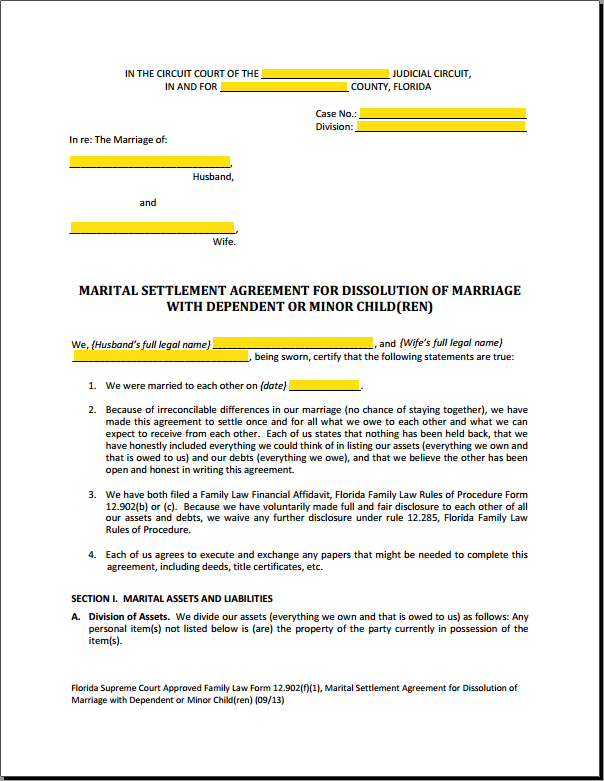 Note: You can file your financial affidavits when you are filing this Settlement Agreement. See the supporting forms box below for links. ¶ 4. Agreement to take further actions in order to fulfill any parts of this agreement. Such as a Quit Claim Deed to property, and any other transfers and contract amendments. ¶ 1. 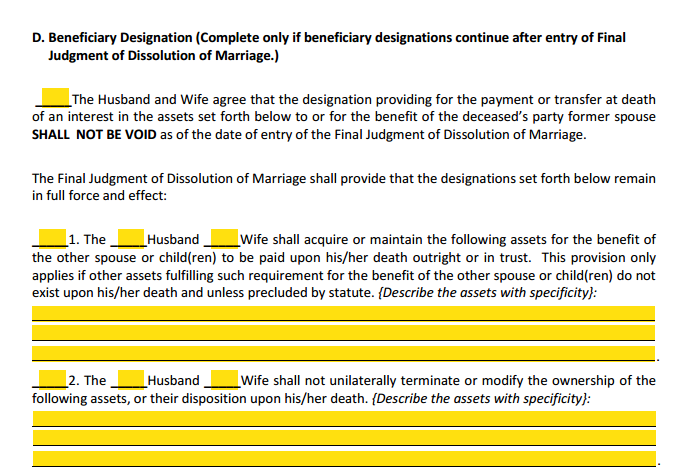 This is the section where assets will be claimed by the Wife and the Husband will have no rights or responsibilities. Remember to include any important details such as whose name is currently on the title, deed, or contract. TIP: Sensitive details such as full account numbers may be left out. You can put the last 4 digits, for instance, if you need to differentiate between two similar accounts. ¶ 2. 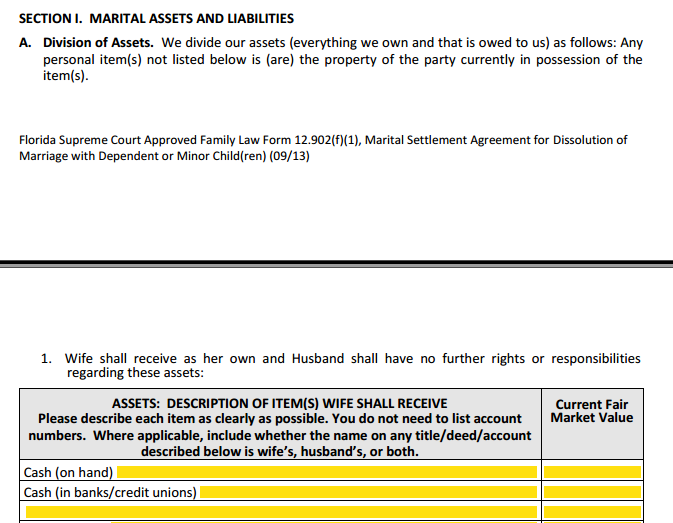 The same as paragraph 1 in this section except that these are assets claimed by the Husband. ¶ 1. 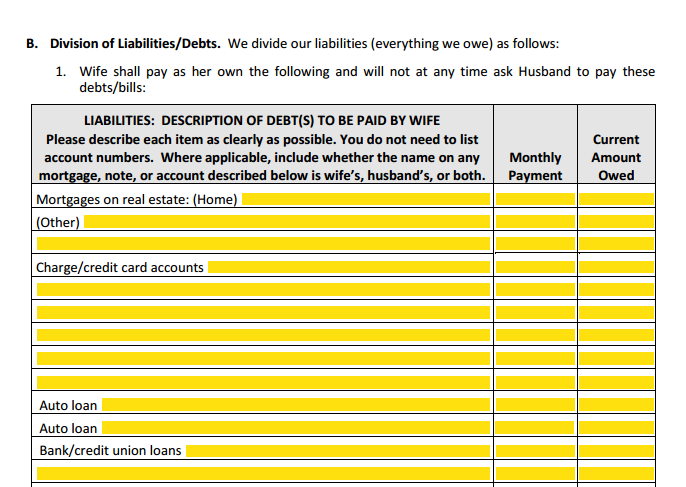 This is the section where debts will be payed by the Wife and the Husband will not have to pay. Remember to include any important details. ¶ 2. The same as above except the Husband will be fully responsible to pay these debts. These refer to any that were listed in your Financial Affidavits. Explain how these will be divided. If there are none to divide, you can enter NONE. This part is where you agree to keep as a beneficiary to assets such as a primary home go to the other spouse even after the divorce is final. This is commonly done where there are children involved. The first check box indicates that you agree to such an arrangement. ¶ 1. This box is checked if there is no existing provision and that you or your spouse must make this happen. Describe the asset or assets that this applies to and you can include any actions that will make this binding, such as filing a Last Will & Testament, or amending a deed or title. ¶ 2. Check this box if an existing beneficiary designation should not be changed. Again, describe the assets and any other information in detail. ¶ 1. Check here if neither of you are seeking alimony from your spouse and move on to Section III. ¶ 2. This is where you designate who will pay for alimony, also known as spousal support. 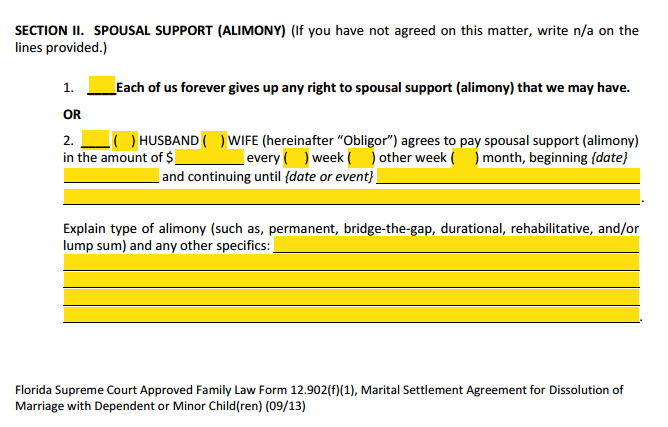 Enter the amount of spousal support, how often this amount should be paid, and the date these payments are to start. Here you explain the type of alimony this is, and explain why this should be ordered. ¶ 3. Optional. State any other request in regards to the alimony you are seeking here, such as income tax treatment of the payments. ¶ 4. This is where you request that life insurance be maintained to safeguard the alimony payments. Note: Alimony is a very technical part of the law, and you should seek legal advice even if you plan on filing Pro Se. ¶ 1. List the names of your children here with their birth dates. ¶ 2. You will be attaching your Parenting Plan here as exhibit "A" if this is the first or only attachment to the MSA. "B" if it is the second attachment, "C" if the third and so on. Note: You can download the parenting plan form from the Supporting Forms box below. 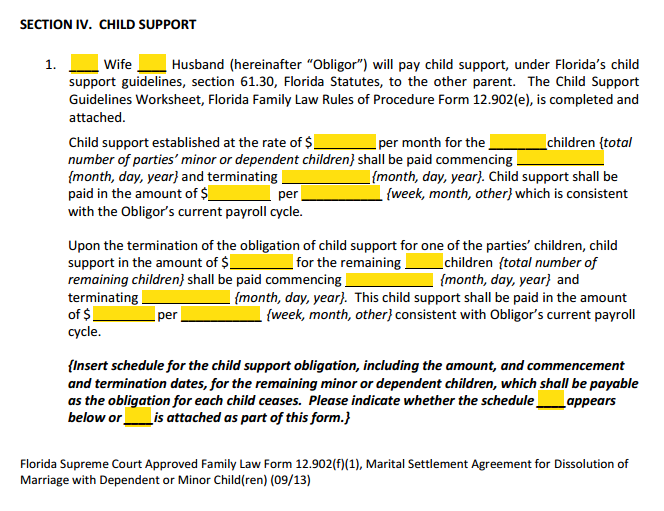 The Child Support Guidelines Form and Worksheet is available in the downloads box at the end of this page. ¶ 1. Check here who will be paying the child support ordered per the Child Support Guidelines. Check the appropriate box. You will need to attach a Child Support Guidelines Worksheet. Child Support established... Here you enter the total monthly amount of child support, the number of children, and when this amount starts and when it ends. You also enter the amount of support that will be paid and the frequency. Usually, this coincides with the payroll cycle at work. For example, if the monthly amount of support from the Child Support Guidelines worksheet is $600.00 and the payroll is sent every other week, the amount you put here would be the yearly amount divided by the number of paychecks in one year = 600 (monthly amount) x 12 (months in a year) ÷ 26 (number of paychecks per year) = $276.92 plus any amount for the agency handling the payments, such as DCF. Upon the termination... Here you enter the child support amount once the obligation ends with one or more of the children, and there are children that remain dependent. Fill out as you did above. Insert schedule for... Repeat this process as needed in the space provided. If you need more room, you can instead attach a Child Support Schedule as an attachment and indicate here that you are doing so. Still in High School up to the age of 19. The obligor shall pay... If you are requesting a child support amount that exceeds or is less than that prescribed by the child support worksheet by 5% or more, you may need to file a Motion to Deviate Form 12.943 (find link in the Supporting Forms box below) and enter the reasons for this deviation here. ¶ 2. Retroactive child support is indicated here. Arrears are paid in addition to the child support amounts from above. Indicate the total amount of the arrearages, the additional monthly amount to be paid, the payment schedule, and the day they are to begin. This amount will end when the total amount has been paid in full including any statutory interest. TIP: For further information on calculating the statutory interest, read this article published by the Florida Bar. ¶ 3. Health Insurance. Check here if health insurance for the children will be maintained. This includes the Affordable Care Act, also known as Obama-care. You may also opt-out of health insurance, and include how out of pocket expenses will be divided. c) Some other arrangement. You need to explain what this arrangement is (ie. 75% Husband, 25% Wife). There is a statement here that details notice of these expenses. ¶ 4. Dental Insurance. You can choose who will pay for the insurance if any, and also decide how the uninsured portions will be payed. Similar to the health insurance in paragraph 3 above. ¶ 5. Life insurance is usually maintained on the party paying the child support for as long as the children are dependent. The amount of insurance is normally calculated to cover the total amount of child support for as long as any of the children are dependent. ¶ 6. Tax deductions for the children can be specified here. Some people use an alternating schedule as to when to claim their children on their tax forms. This is usually tied to the percentage of time-sharing that is agreed to. For example, if the time sharing percentage is about 2/3 with the mother and 1/3 with the father, you may agree to the father claiming the children as dependents one out of every three years. We recommend that you talk to a tax professional and a family law attorney before you agree to any arrangement. The tax form that is used for this is the IRS Form 8332, Release/Revocation of Release of Claim to Exemption for Child by Custodial Parent. ¶ 7. Other provisions for the support of the children can be explained here. Any special circumstances that has not been addressed in the previous paragraphs can be written here. Some examples not on the form, include costs for travel to family, academic, or extra-curricular school events. We helped prepare forms for one divorcing couple that specified who would pay the costs for vet care for an adopted animal! They reasoned that they adopted the animals for the benefit of the kids. The petitioner told us the judge didn't even blink when she read it. At least we thought it was novel. Any agreements you would like to address that did not fit into any of the other sections can be entered here. See the example we wrote about above in the other provisions paragraph of the child support section. There is no reason something like that could not be included in this section. If you need more room you can include a statement like... See Attacment "X" for Additional Marital Settlement Agreements. We'd love to hear about any ways you have used this section to report and give as a tip to others reading this step by step guide. You can share your story on our divorce faq page or leave your comments below. Thank you. Any issues that have not been agreed upon and you would like the court to address, should be entered here. This includes sections of this MSA form that you have not come to an agreement. This allows you to at least enter into an agreement that covers most of the issues in your divorce and have the court decide on as little as possible. TIP: We've seen too many amicable divorces turn into very heated and expensive disputes because of one issue the parties decided to leave unresolved. You may want to consider Divorce Mediation as an alternative to a trial. It may be in your family's best interest to do so. It is almost always best to address all of your issues before trial, but if you can't come to an agreement, you have this option. This section is self explanatory. Fill out both of your names, addresses, and contact information but DO NOT sign until you are in the clerks office filing your paperwork or witnessed by a Notary Public. The deputy clerk or a Florida notary will witness your signatures for a fee. TIP: You can save a few dollars by having your MSA notarized by your local bank. Many banks offer free or minimal cost notary services for their account holders. Buy our Premium Forms Packet which includes the MSA Premium Form, these step by step instructions & much more.